Moisture: Feeds mold spores. The 3 moisture points in the crawlspace are the ground, foundation, and condensation. This adds up to 19 gallons of moisture per day. 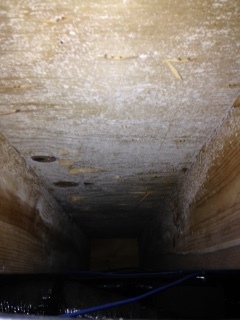 Mold spores: Are naturally in the air and get into your crawlspace. When you mix mold spores with moisture, humidity, standing water, and condensation, the result is mold, wood decay, and unhealthy air that you breathe in your home. 40% of the air you breathe on the first floor of your home comes directly from your crawlspace. The resulting problem cannot be solved until the root problem is solved. 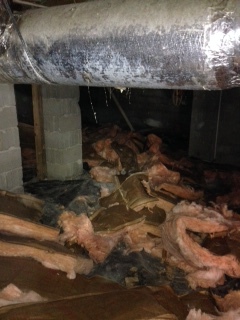 Crawlspace Solutions CLIMAZONE provides a PERMANENT solution to every root and resulting problem. Moisture Solution: After sanitizing and disinfecting your crawlspace, we use a reinforced polyethylene moisture barrier to seal your crawlspace. Humidity Solution: We use top of the line Aprilaire dehumidifiers that remove humidity, moisture, and allergens from the air. Standing Water Solution: We install drain systems with sump pumps to remove standing water. 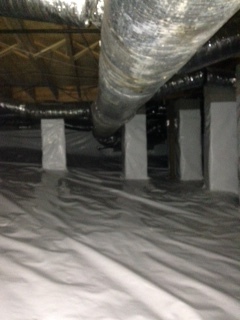 Mold Spore Solution: We foam-seal all cracks and openings to prevent allergens from entering your crawlspace. Problem solved with a lifetime warranty offered by Crawlspace Solutions, LLC! © 2017 Crawlspace Solutions, LLC.